Most will agree that the PDAF (Priority Development Assistance Fund) or pork barrel had not been completely abolished. It’s the same old pork but served with a different menu. 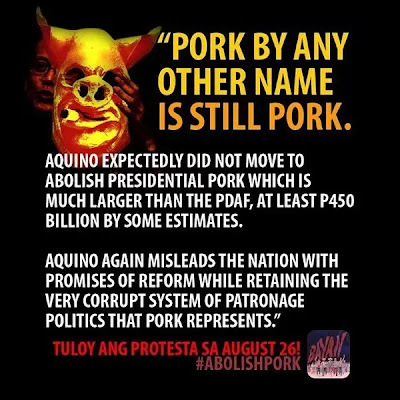 Be it adobo, menudo, lechon, or what not; it’s still the same old pork barrel and only the term PDAF itself had been removed. Thousands who are still not convinced gathered for the Million People March yesterday, August 26, 2013 (National Heroes Day) at Rizal Park, aiming to completely eradicate pork barrel. Rallies were also held in this advocacy throughout the country and in other places worldwide. But the Pres. Noynoy Aquino is at least commendable for trying to wash the blemished reputation of the pork barrel funds. PDAF had been abolished. Congressional, senatorial, and other projects in need of funds will no longer be made available for NGOs and even government agencies. All proposed projects will first be subjected to analysis and will be followed through to ensure that funds are appropriately used. Among the changes imposed, the latter is most admirable for the attempt and effort at least. Although many of us had been discouraged after the Napoles pork barrel fund scam hit the news, we have to admit that there are still bona fide projects where PDAF had been effectively used. Completely removing funding for such projects won’t solve the problem either. Corruption still remains and public funds can still be pocketed in a different way. It’s more of a moral problem. Morality is low in this country which is why it’s quite common for government officials regardless of the level to forget their moral values in exchange for money. In some countries, public officials who become involved in controversies including corruption cases commit suicide for the sheer shame alone. Not that I encourage this practice but some people just lack decency when tempted by money. Also, most can get away clean yet filthy rich from corruption. There were not many who were prosecuted for related cases. Still in relation to the supposedly new pork barrel system, knowing how bureaucratic the Philippine government is, even new proposed projects will be subjected to the palakasan system. Only politicians with padrino on agencies approving the future PDAF, HOLDAF, NACAW, or whatever it’s going to be called next, will be allowed to pursue their projects. It’s disheartening to know that public funding which would have been better off spent in worthwhile projects including anti-flooding systems are stolen by a few for their personal interests. So you can’t blame taxpaying Filipinos to attempt evading tax (even if it's criminally unlawful) while those who have no choice but to pay (like call center folks who pay thousands twice a month per salary cutoff) are disgruntled. The BIR’s task of hunting popular personalities for tax evasion is rather useless if taxes collected fall into the wrong hands. Every Filipino pays taxes at one form or another. Heck, you pay taxes even when shopping or dining out! So renaming PDAF or altering its mechanism wouldn’t help. What must be done include scrapping pork barrel in its entirety, accounting for all lost funds, and prosecuting everyone (and it means everyone) involved in the scam.